On the occasion of his birthday, I would like to talk a bit about someone I never could’ve met, but feel like I somehow must have. Sam Cooke hit the glass ceiling as a Gospel Star, so he took the way he had been singing about Jesus and sang about girls instead. He is called “The Man Who Invented Soul” by some. A lofty claim, as if Soul is the light bulb, the electric can opener, or the car door power window and could be decisively constructed or built for the first time by somebody. Perhaps it’s impossible to credit any one person with a kind of music, but if you can, Sam’s the Man. Beyond his undeniable voice and brilliance as a songwriter, Sam was possessed of a kind of sharp intellect and obsessive ambition that led him to forge a career unheard of before or since. So why do you so rarely hear about him anymore? I think that a big part of why Sam Cooke’s legacy has been in deep freeze, putting aside the fact that he got shot 3 times with his pants off in Watts, is that his catalog of hits is spread over three labels, and there are many sides to Sam Cooke. His records were designed to appeal to as many people as possible. 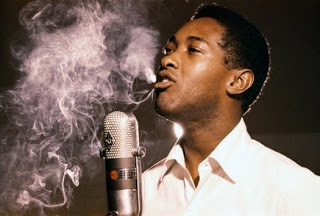 Sam was a Gospel Singer, a Pop Singer, but in his truest heart of hearts, I’d like to think he was the pure, visceral Soul Singer that is unleashed like a Panther from a cage on the recently re-released One Night Stand: Sam Cooke Live at the Harlem Square Club. This thing is an exaltation of life sung with such conviction and such pure power, with an audience that is so very involved and enamored that it will make you dizzy. It’ll make bad times good and good times great. Sam could emote on a level that is untouchable. I heard Sam sing about Jesus and I could believe in Jesus, in every miracle ever heard of. I heard Sam sing of love and I thought of when I had fallen in love, and I saw it as if Michelangelo had painted it. Got it, don’t got it, want it, don’t want it, it doesn’t matter-Sam could sing them all. And he wrote them all-he was a master of writing songs the way people speak but to still capture and amplify the poetry of things, sometimes mundane. “You say it’s time to go and she says yes I know/But just stay one minute more/That’s where it’s at.” Steinbeck couldn’t have written something so true and yet so simple. Sam’s personal story is one that fans of Greg Dulli’s lyrics couldn’t fail to find compelling. A charming ladies man who was sometimes a master manipulator who would “walk past any nice girl to get to a whore.” a cunning prince of a man who could make anybody feel great who met him…if he wanted them to feel that way. Sam was drop dead supper club cool at the Copacabana in New York City, a fiery Soul Shouter in the Harlem Square Club in Miami, a preacher in Chicago. A womanizer, family man, deadbeat dad, civil rights activist, entrepreneur. All these things at once, always on his own terms, and always a mystery-for the Real Sam Cooke remained a mystery as tight as the occurrences at the hour of his death. The only thing we know for sure was that he was somewhere he shouldn’t have been doing something he shouldn’t have been doing, and we all paid for it.When I think about Sam a lot in one sitting, I inevitably get angry with him for leaving the mortal coil in such a foolish way. After living such a brilliant life.